Probably the dirtiest, punkiest sounding guitar ever to have left the PRS factory: a real soapbar tour de force! Faultless build and function with added resonance; Great 'working man's' vibe. Not evryone will want to pay £2,000 for a 'plain Jane' guitar. If PRS Guitars had come to market back in 1985 with just an all mahogany guitar we probably wouldn't be writing about the company today. From the outset PRS did offer an all-mahogany guitar, the Standard (originally just called the PRS Guitar), but it was the curly maple-topped Custom that became the definitive PRS. Figured maple, barely used in the industry at that time, became synonymous with the high-end 'boutique' guitar. The Custom still outsells the Standard by a large ratio; it's the same with the company's trademark bird inlays that are way more popular than the more traditional moons or dots. Combine those features with a 'dipped in glass' ultra-glossy finish and PRS established the blueprint for the modern 'posh' electric guitar that recalled the finest late fifties flamed-top Les Pauls but seemed the antithesis of Fender's 'blue-collar' Telecaster. Throughout its 21-year history, however, PRS has struggled to maintain this quality. Even though PRS now uses many computer-assisted machines, the hand sanding and finishing process is still an expensive and labour intensive process - one reason that means the company's guitars remain, for many players, unreachable. Last year PRS, with its 20th Anniversary Standard, found a way to trim some pounds off the high manufacturing cost by offering the guitar in a satin nitro-cellulose finish. The Modern Eagle had featured a similar finish but the Standard's finish, less smooth and more tactile, was simpler still. And with less handwork involved savings were passed on. Earlier this year PRS expanded the concept into the Satin Series that effectively trims £100 pounds off the price of a high-gloss equivalent. But this isn't quite accurate. Satins come with bird inlays as standard - a £299 upgrade on a High-Gloss instrument. In reality you're saving £399. 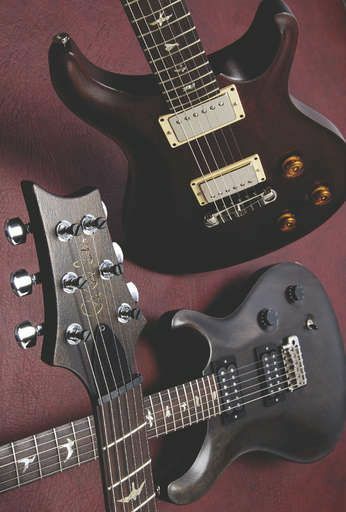 Confusingly, the Modern Eagle and new-for-2006 Singlecut Trem Modern Eagle are grouped in the Satin Series too, but not only are these the most expensive PRS production guitars, but as we've said the finish is achieved with a different process. So the real story is that the cost-effective Satin Series guitars total six models: the all-mahogany Standard 22 and 24, Singlecut Standard Satin and Singlecut Standard Soapbar Satin, available in four colours, and the more expensive maple-topped Singlecut Satin and Singlecut Trem Satin that are offered with eight colour options. At the time of writing no maple-topped Satins had arrived in the UK so here we'll concentrate on the most affordable all-mahogany model. As we explain in our Satin Touch sidebar the Satins are identical in build to the High-Gloss finish guitars right up to the start of the finishing process. Unlike some other companies' 'cost effective' ranges, there is no difference here between a Satin or High-Gloss model in terms of wood grade, hardware, pickups, fretting or set-up. And each one still comes with a standard PRS hard case. While the Standard 22 and 24 are literally satin finish versions of the regular High-Gloss models, albeit with fewer options and colours, the Singlecut Standard Soapbar Satin is actually a brand new guitar. Soapbar single-coils (generically known as P-90s after Gibson's original design) aren't new to the PRS range, currently they're featured on the McCarty Soapbar (and the current SE Soapbars), but this is the only two-control Singlecut with a Stop-Tail - the standard format on the double-cut guitars and the Singlecut Trem. In fact, with its all-mahogany construction, Singlecut shape and soapbars it's a USA-made version of the first, and now discontinued, Singlecut-shaped SE Soapbar. It's certainly noticeably different to the High-Gloss Singlecut. The body, before sanding/finishing, is the same thickness as the Singlecut Trem at 53.3mm; here, after the sanding finishing process, it measures closer to 52mm, noticeably less than a High-Gloss Singlecut's near 60mm girth. Weight-wise it's noticeably lighter than any Singlecuts we've played. And it might be the lack of finish very marginally reducing the dimensions but the wide-fat neck here feels noticeably smaller in bulk, more delicate overall. The Satin finish itself, charcoal on this model, is more open-grained than the Modern Eagle, more textured too. And although it's primarily a grey/black the muted brown of the mahogany subtly shows through creating more depth than a simple plain black stain. As we noted in our 20th Anniversary Standard review, this finish will mark more easily and burnish to a semi gloss with use. It's not an aged finish in anyway but it will age more quickly with use than a High-Gloss finish, which stays just that. We have PRS's Phase II locking tuners here, although they partner a Stop-Tail bridge, not a vibrato. They are an elegant positive tuner that make restringing ultra-fast and are standard across the USA range with the exception of the High-Gloss Singlecut and McCarty that use the older Kluson style 'vintage' tuners. Whereas that original SE Soapbar used classic black-covered soapbar single-coils, the ones fitted here - 'specially voiced' Seymour Duncans - have cream covers and a cream switch tip. We're not sure that black covers and switch tip wouldn't have suited the guitar more, but the covers certainly make a feature of the pickups. The two-knob master control set-up is hallmark PRS although the Singlecut, of course, has volume and tone for each pickup. With a three-way toggle switch pickup selection is fast and classic. After the bulk and weight of the Singlecut proper this new Soapbar feels a bit insubstantial. It's the least wide-fat neck we've ever played and to be honest things were not going well until we plugged in. Twenty minutes later it'd be cash on the shop desk. Its raw, bright-edged and surprisingly powerful voice is resonant and comes with that all-important grinding midrange. And that's just the bridge pickup. Flick to the neck and there's that fluid, singing voice that doesn't sound too smoky, a little hollowed but has bags of depth. It cleans up nicely and reminds you this is definitely a single-coil guitar. There is pickup hum - unless you select the funkier hollowed mixed pickup position which is hum-cancelling - that can be intrusive, but a cranked P-90 remains such a classic sound. We don't know why PRS didn't just call this the Singlecut Special.